The lenses of this style of eyeglasses cover the entire eye area, usually from the upper cheek to above the eyebrow, though the actual size may vary. When combined with a bold frame style, these eyeglasses become the prominent feature of the face. The lenses can be rounded or squared, but are always sufficiently large to cover the entire eye area. This style is often selected by individuals with widely-spaced eyes or for whom the eyes are a strong feature to provide balance or prevent the eyes from being obscured. 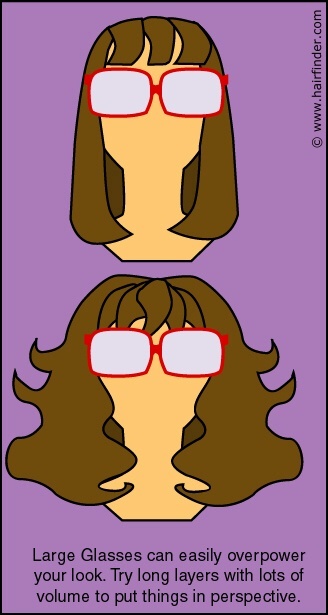 When selecting a hairstyle to accompany large eyeglasses it is important to remember that proportion is the key. A long, low-volume or straight hairstyle will cause the eyeglasses to stand out, often to the point of overpowering the face. Shorter, gamine hairstyles will even further intensify this effect. The best choice is a style that can hold its own - a long, layered style with extra volume on the sides will put large-framed glasses into proper proportion. If you choose at some point to switch to contact lenses, the style can be modified easily by styling it with less volume on the sides. Doing this will continue to balance wide-set eyes, but will prevent your hair from becoming the overpowering feature. This is currently the most popular set of style in eyeglasses. The lenses are usually just large enough to cover the eyes themselves with frames that are delicate and unobtrusive. These eyeglasses most often look best on petite women with narrow or smaller faces, and is also a popular choice of style for those who only need glasses under specific circumstances (such as while reading or driving) because their size makes them easier to carry than large, bulky styles. When it comes to choosing a hairstyle, the concern with these styles of eyeglasses is in making sure not to 'box in' the facial features, which makes the face seem even smaller and can result in a bookish appearance. It's best to go with styles that fit the face and head in question and offer enough visual interest to make the eyeglasses a secondary consideration. 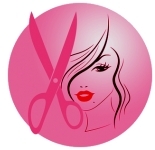 For example: A short-cropped, wavy, gamine haircut will highlight the face but leave it open, while the classic, chin-length bob will create a frame of the face and therefore feature the eyeglasses. It will also cause the face to appear smaller. 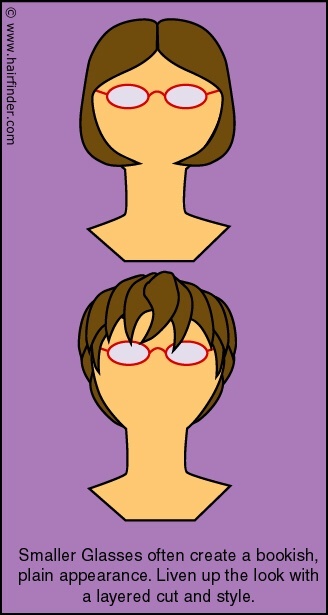 In the case of non-petite women who choose small-framed eyeglasses, the same rules apply, and the face-framing bob haircut still would not be a good choice. However, longer, blunt haircuts with or without volume (depending on the face's width) can be wonderful. Switching to contacts from small-framed eyeglasses will likely not have much of an effect on how you might need to style your hair, except perhaps to allow you to go with less volume if desired. Finally, do bear in mind that these rules would also apply in the case of sunglasses. In fact, in a lot of cases women spend as much or more for their designer sunglasses as they do for their prescription glasses. If you have both sunglasses and prescription eyeglasses, and they are of different styles, try to think of ways you can alter your hairstyle to follow the rules for the sunglasses' style, obviously without a permanent change. Outdoor parties, trips to the beach or amusement parks, etc. all warrant long periods of sunglasses wear, and thus a need to possibly alter your normal hairstyle to look your best.